Many individuals investigate opening a certificate of deposit account because they’ve heard that it’s one of the simplest and safest ways to make a good return on their savings. Get the most from your money with competitive rates. Many individuals investigate opening a certificate of deposit (CD) account because they’ve heard that it’s one of the simplest and safest ways to make a good return on their savings. They might have also heard that it doesn’t take someone who’s financially savvy to figure out how to use this type of investment strategy. However, there is one aspect to the process that takes a little thought, and that’s finding the best CD rates. Your certificate of deposit rate equates to the amount of money that the bank will put into your account annually. 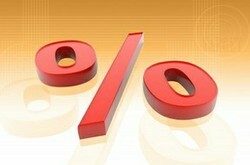 The number is a percentage of the balance that you deposit into the account when you open it. This means that you don’t get a higher rate by contributing more money, but you make more money by keeping a higher balance in your account for a longer period of time. For example, if you put $10,000 in the bank for 10 years, you will most likely get a better rate than if you put the same $10,000 in for 5 years or if you put $5,000 in for 10 years. Average rates vary depending on how long you are investing and how much you are investing, so you’ll need to compare options. The ultimate way to get the best CD rate is to utilize CD calculators before you go any further in the account-opening process. These calculators remove the hassle of performing any complicated math; they have you enter your base amount, length of investment and the CD rate to crunch the numbers for you. You may want to go to a bank who offers this tool such as DiscoverBank.com. You only need to enter a few fields and the calculator punches out an estimate for how much money you’ll see, including your accrued interest at the time of maturity. Before it’s time to use a certificate of deposit calculator, you’ll want to do some guesswork about your own needs. Carefully evaluate your own finances to determine how much you can actually afford to tie up for a fixed amount of time. Create a budget to see how much you spend on a monthly basis, and how those extremes vary from costliest to cheapest months. Consider your history of emergency expenses for some examples of times you unexpectedly spent large sums. Then see if you still feel comfortable with the amount of money and length of time you’ve chosen. Was this information on CD Rates helpful to you?